Today we are partnering with Bethel Music as they release four songs from their upcoming live record, "Victory". Known for anthems like “No Longer Slaves”, “One Thing Remains”, and more, Bethel Music is a community of real people traversing life’s challenges and triumphs. 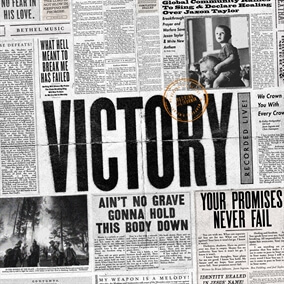 "Victory" harkens back to the story of King Jehoshaphat and the unlikely victory won by sending worshipers to the front lines of battle – a testament that has been essential to the Bethel Music Family throughout the last 12 months. The full album will be available January 25th. For the first time in over a year, Bethel Music is hitting the road for an extended “VICTORY Tour” with Tasha Cobbs and Housefires. The initial two month trek will visit Miami, Austin, Vancouver, Los Angeles and more. The fall run will visit Chicago, Nashville, Brooklyn and other markets. Tickets are available here. Original Master MultiTracks and other worship-leading resources for "Victory" are now available.